SIMFEROPOL, Crimea -- Crimean residents are learning to live with thawing fridges, pitch-dark highways and shuttered schools a week after Ukrainian miliants began attacking the power lines feeding the region. 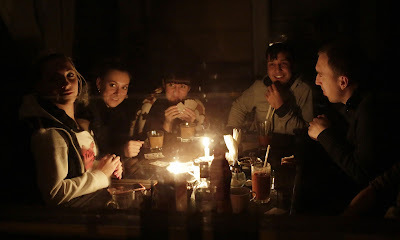 Residents play cards in Simferopol. Locals say supplies of candles and batteries have been exhausted. As Russian authorities scramble to restore power, almost 2 million people have been left without electricity. Despite the hum of generators filling the streets, most businesses have been forced to shut down or dramatically scale back their operations. Major towns are receiving electricity for a few hours a day while some villages have no power at all. Vladimir Putin has hit out at the Ukrainian government, saying without their tacit backing the cut-off would not have been possible. Russia is working to finish a cable across the Kerch strait to link Crimea to the Russian mainland, but it will not be finished until the second half of December, and even then will only provide half of Crimea’s energy needs. For now, hundreds of generators have been shipped to the region. “There are no more candles and batteries in shops. Everything has been bought up,” says Yekaterina, a resident of Dzhankoy in northern Crimea. Some 150 schools and nurseries have been closed until further notice as part of emergency measures imposed by the de facto authorities that came to power when Russia annexed the peninsula in March 2014. The Crimean prime minister, Sergei Aksyonov, called the destruction of the electricity supply a “terrorist act”. “No one will bring Crimeans to their knees, we won’t allow for negotiations,” he said. Presently, back-up power reserves are proving unable to adequately supply Crimea’s hospitals. “The situation could pose serious risks to people’s lives,” says Olga Skripnik, a Crimean human rights campaigner. It’s been a turbulent few months for the region’s residents, who have found themselves at the centre of a geopolitical storm, but many are putting on a brave face. “I think the problems will be resolved, everything will be alright,” says a newspaper vendor in Simferopol, the regional capital. “We are not worried about anything, not even the refrigerators,” one woman in Simferopol said. Elderly residents, recalling the second world war and the shortages experienced before and after the Soviet breakup of 1991, appear to be taking the blackout in stride. “What is there to say when there is no electricity?” says Valentina, an elderly woman sitting on a bench in Simferopol. “No, wait, we have electricity today,” she suddenly remembers. “That was yesterday,” one of her friends corrects from the next bench. “Today we have no water,” Valentina explains. However frustration is mounting over the transportation problems brought on by the blackout – trams no longer run, traffic lights are switched off and the streets and highways are eerily dark. Gas stations have been shutting down one after the other, creating long lines outside those still open for service. “I don’t understand, why isn’t there any electricity?” asks a driver, queuing up to refuel at a petrol station in Simferopol. So far, the majority of Crimeans appear to blame their woes on Ukrainian nationalists and Crimean Tatars, who have been preventing engineers from repairing the damaged electricity pylons. The nationalists in mainland Ukraine, which supplies approximately 70% of Crimea’s energy needs, said they would allow the repair work only if Russia released “political prisoners” – a reference to a number of people who have been jailed on charges supporters say are trumped-up – and let Crimean Tatar leaders return to their homes. In the meantime, Crimeans are bracing for weeks of disruptions and shortages. The senior official among the Russian authorities who control Crimea, Sergei Aksyonov, said it might take his government an entire month to restore electricity to the peninsula.